Brittany Faye Helms was born and raised in China Grove, North Carolina. She received her B.F.A. in Ceramics from East Carolina University in 2009. After graduation she continued wood firing as a year-long artist in residence at The Cub Creek Foundation in Appomattox, Virginia. 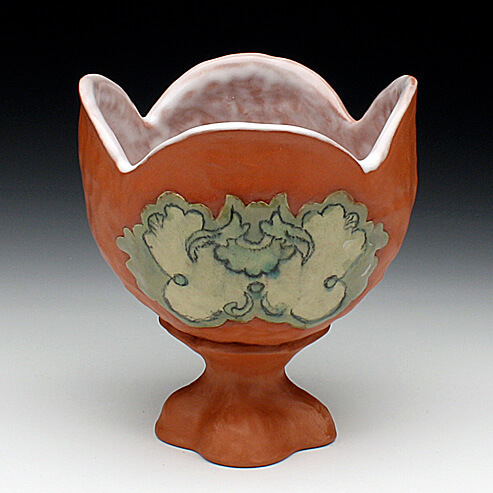 In the fall of 2010 she attended Southern Illinois University of Carbondale for a post baccalaureate to explore earthenware. Shortly after, she enjoyed being a year-long artist in residence at The Red Lodge Clay Center and used her time there to prepare and apply for graduate school. In May 2016 she completed her Master’s in Ceramics at The Ohio State University. Currently, Brittany Faye Helms is a lecturer at The Ohio State University in Columbus. I carefully form and accumulate multiples, finding comfort in the plenty. Using the multiples to build quickly and directly, I intend to use clay sympathetically and to expose its raw and malleable qualities. I use and misuse the visual language of pottery, manipulating structure and abstracting the familiar. Masses of earthenware adjust to these transgressions, making compromises that reflect the body’s systems of counterbalances. In this reflection of movement, proportion, and scale these compositions become bodies that enact similar processes to my own. Losing fleshy resiliency the soft vegetal abundance dries and becomes brittle. Through the building of these objects I learn about and understand myself and my environment.